Royal Wheels India is an adventure travel group organising Alaknanda River Rafting Tour in India. Day 01 : Drive 5 hours from Delhi to Camp Silver Sands on the banks of the Ganga (27kms. beyond Rishikesh). Stay Overnight at Silver Sands. We pass through the sugarcane belt of India and reach the holy town of Rishikesh where the Ganga river enters the plains. We check into camp, which is located on a large sandy beach on the banks of the Ganga river - briefing on Camp, its activities and the trip to follow. Campfire dinner and overnight at Camp. Day 02 : A relaxed day at Camp - choose to do an early morning hike or take kayak lessons. After lunch, we drive 4/5 hours from Camp to Rudraprayag. Enroute we stop at Devprayag, to se the confluence of the two rivers (the Alaknanda and the Bhagirathi) which meet to form the Ganga. Overnight at Rest House/Hotel. Day 03 : After breakfast, help in getting the rafts readied and packing bags. A detailed safety briefing follows with instructions on paddling commands, rapids to be encountered etc. Expedition begins with a big Grade IV rapid, "The Holy Hole", at the confluence with the Mandakini. Rapids keep coming in quick succession. Soak in the sun, river and scenery, staying ale rt to help negotiate rapids. Lunch at a waterfall and continue to make camp for the night after Srinagar. Long day on the river, covering about 36 river kms till Maletha beach. Campfire dinner and overnight Camp. Day 04 : Raft down to Devprayag, the confluence of the Alaknanda & Bhagirathi rivers. The river is now called the Ganga. 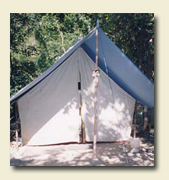 Camp at Beas Ghat, a famous fishing spot for the mahseer, also called the Ganga Gold. Cover 30 kms for the day. Day 05 : A relaxed day with few rapids. A day for swimming, body surfing, relaxing and spotting wildlife. Make 30 kms to reach camp below Kaudiyala, after running a couple of Grade IV rapids, "Daniel's Dip" and "The Wall". Day 07 : Drive down to Shivpuri after breakfast to begin the final day's run with big rapids, the "Roller Coaster" and "Golf Course" to make it an exciting end to a grand adventure. The trip ends near Rishikesh-lunch and depart for Delhi.